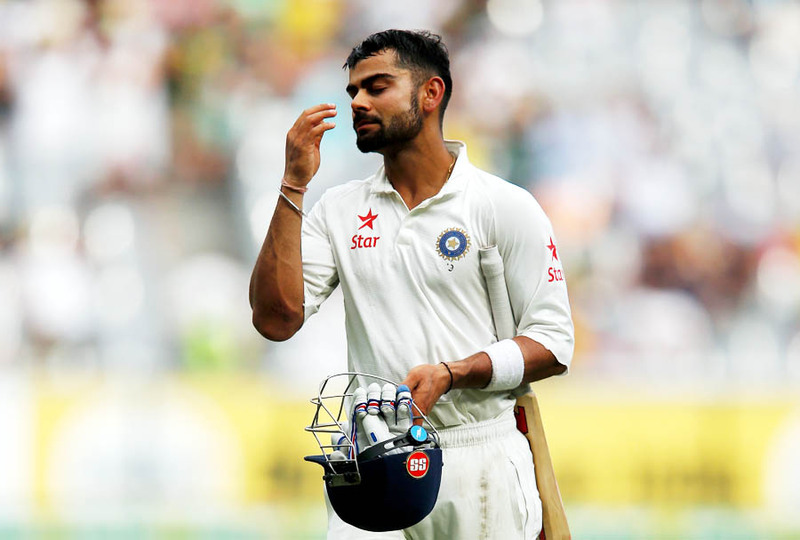 Virat Kohli was dismissed in the final over of 3rd day of 3rd Test between Australia and India at Melbourne on Sunday. Virat Kohli (169) and Ajinkya Rahane (147) notched up fine centuries before Australia scalped five wickets in the final session to reduce India to 462/8 at stumps on Day 3 of the third Test on Sunday in Melbourne.Kohli was out in the last over of the day when Brad Haddin took an outstanding catch behind the stumps off the bowling of Mitchell Johnson.Rahane shrugged off a nervy start and continued to score at a brisk pace en route to his third Test ton, all of those coming overseas and along with Kohli added a massive 262-run for the fourth wicket. Kohli's innings was a brilliant one too as it came at a good pace and consisted of some superb shots. Kohli and Johnson were involved in verbal banters throughout the day -- with Kohli hitting him for crisp boundaries before the latter having last laugh.Resuming the day on 108 for 1 in response to Australia's mammoth first innings score of 530, India lost their overnight batsmen early on. Cheteshwar Pujara (25) did not trouble the scorers on day three as the No.3 batsman was out on the second ball of the day as Ryan Harris induced an outside edge and the catch was beautifully held by wicketkeeper Brad Haddin in front of first slip.Murali Vijay (68) did add a few runs to his overnight score and hit a couple of lovely boundaries before he got hit on the back of the helmet off a Johnson delivery. Vijay recovered but was out five runs later when he played an almost identical shot that led to Pujara's dismissal and was well caught by Shaun Marsh at first slip off Shane Watson.Rahane got a tough chance on eight when he got an outside edge off spinner Lyon that flew between the keeper and first slip to the boundary rope. Resuming after lunch on 224 for 3, the duo scored at a brisk pace before Rahane took a counter-attacking approach and Kohli playing a near perfect innings. The duo though was helped by a few dropped chances as both the batsmen capitalised on their respective spills.Rahane, getting his third Test hundred in 13 matches, gave a simple caught and bowled chance to offspinner Nathan Lyon only to see it go between the bowler's palms. He was then on 70. Kohli got into a heated argument with Johnson and the verbal volleys seemed have an adverse effect on the Indian vice-captain. He was soon dropped on 88 by Watson at first slip as a disappointed Johnson watched on.Rahane soon brought up his ton with a slash over gully off Watson for four and raised both arms into the air in celebration. Kohli joined him just before tea with a cracking cover drive to the boundary off Lyon for his third ton of the series after twin centuries in the first Adelaide Test. Rahane brought his century in just 127 balls, maintained a quick scoring-rate, hitting 15 fours. Kohli mixed the right dose of caution and aggression and brought up his ton in 171 balls with the help of 11 boundaries.At tea, India were 336 for 3 with Rahane unbeaten on 111 and Kohli not out on 104. But the final session of the day turned things slightly in favour of Australia as the visitors lost five wickets in regular intervals.Early in the final session, Kohli and Rahane continued to dominate. Both worked their way into the 140s, taking their partnership past 200. Eventually, it ended on 262 when Rahane was dismissed leg-before when he missed a sweep off Lyon.That sparked a small collapse with debutant KL Rahul playing a horror shot despite being dropped one ball earlier. He top-edged Lyon's delivery and was taken at short fine-leg. MS Dhoni struggled during his innings of 11 and was caught behind of Harris. R Ashwin soon followed his skipper back to pavilion without disturbing the scorers. He lobbed a catch back to Harris.Kohli, at the other end continued his fine form and brought up his 150, his first in Test cricket. But it made Australia's session when Kohli got out in the last over of the day as he edged Johnson's delivery to the wicketkeeper at 169.